About a month ago, our family took a weekend trip to visit friends in San Antonio. When it was time to leave, I put the blanket in a plastic bag for laundry. When we got home, we did not get everything unpacked right away. Several days later, my daughter noticed she could not find the blanket. We have looked everywhere in our house. We have had our friends scour their house as well and cannot find the blanket. Almost every day my daughter asks me if I have found it. Everyday, I keep looking for it to no avail. I am afraid it may have gotten tossed out with the trash. I know she is upset about it and is thinking about it. I am now in search of a replacement as well as still searching my house. The blanket is a “Koala Baby” brand and is called “Koala Baby Cozy Fleece Receiving Blanket – Pastel Plaid. 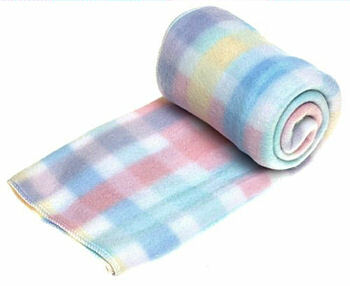 It is light weight fleece fabric and is white with a wide band pastel plaid design. The edge is just plain with white thread edge stitching. I originally purchased it at Baby’s R Us in fall 2001. It came rolled up with a label around it. I have begun searching internet sites and am surprised that I have not found one yet. However I will keep searching. I am also going to email your website to friends who have kids. Maybe they can help not only me, but the others who have items listed as well. I appreciate your help and your website. I know that this is not pastel but it is the same blanket in bright colors. I Thought it may be worth a look.